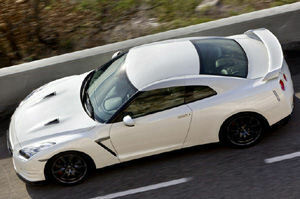 The Nissan GT-R's dramatic styling is refreshed for 2011. The new front fascia is highlighted by a new front bumper with double rectifier fins and Hyper Daylight with a large-diameter reflecting surface and high intensity white-color LED lights. The design increases front downforce by about 10%, while also reducing air resistance inside the engine compartment. The volume of air that passes through the radiator and cools down the front brakes is also increased. The "super wide beam" headlights feature three additional sub-reflectors to give a wide illumination spread. The speed-sensitive windshield wipers include an auto on/off feature. The GT-R’s hybrid body construction is created with a combination of steel, carbonfiber and die-cast aluminum and body features a lowered coefficient of drag of 0.26 after the facelift, versus the 0.27 of the previous model, yet achieves high front and rear downforce for improved stability and handling performance. For improved rigidity, a highly rigid, lightweight strut supporting bar, made of carbon composite with aluminum honeycomb material, is installed in the partition wall of the engine compartment. By linking the right and left struts to quickly receive suspension input, the vehicle body's responsiveness to driving operation is enhanced. An additional support member is installed in the passenger side of the instrument panel. The signature rear view of the Nissan GT-R is provided by its hallmark four-ring taillights, which include high-intensity LED fog lamps as standard equipment to help improve visibility from vehicles behind in rainy or snowy conditions. The redesigned rear bumper features a lower center of gravity than the previous design, created by a sculptured lower portion and extended length, while air flow above and below the vehicle is managed by the functional carbonfiber underbody rear diffuser, which has been altered for 2011 for enhanced underfloor cooling and reduced air resistance. Cooling performance for the muffler isfurther enhanced and rear downforce is increased by about 10% through use of a new rear bumper air outlet, which helps remove air in the rear wheelhouses. Sculpted performance bucket seats give the driver and passenger a comfortable driving experience, and soft pads are utilized on the dash in front of the passenger and both doors to give an extra level of comfort. The new Nissan GT-R's cockpit-style instrument panel surrounds the driver, with all meters and multi-function meter at a uniform height to minimize the driver's head movement. A large center-mounted tachometer, with gear display on its upper right, as well as the easy-to-read graphics of the display, gives the driver instant detailed information, essential for the performance nature of the GT-R. A large, metallic-framed center console features an ergonomically designed shift lever and a red “engine start” button. The centerpiece of the instrument panel is a video game-inspired multi-function display. Eleven pages of information are available on this system, including mechanical and driving information, acceleration, brake pedal pressure, steering angle and a recording function with playback. Additional on-screen information includes a Navigation system, an entertainment system with a 9.3 GB Music Box Hard Drive and DVD video playback capability and Bluetooth Hands-free Phone System. The navigation system includes XM NavTraffic with Real-Time Traffic Information and NavWeather™ capabilities. Also included is a specially designed 11-speaker Bose audio system with two forward-facing woofers in the rear center armrest area. Streaming Audio via Bluetooth is standard. Standard safety equipment includes a Nissan Advanced Air Bag System for driver and front passenger, front seat-mounted side-impact supplemental air bags for driver and front-passenger and standard roof-mounted curtain side-impact supplemental air bags for front seat occupant head protection, along with front seat belts with pretensioners and load limiters and tension reducers, and three-point ELR/ALR rear seat belts.